There’s no place like home for the holidays. But when home is Pagosa Springs, Colorado where people are more interested in the latest ski report, and you’re an art writer, well, home is more a place you retreat to than a place you spend a Saturday viewing art. That’s not the case thanks to Michael and Denise Coffee and Shy Rabbit Contemporary Arts. On Saturday, the Coffees opened an exclamation point of a group exhibit featuring 17 artists’ work that has graced the walls and floors in 2011 at this secret, visual art treasure in the proverbial middle-of-art-world nowhere. Shy Rabbit’s 4,000-square-foot space is larger than many exhibition spaces in Denver, Fort Collins and Santa Fe. But it’s the quality of the work that truly shines. I’ve been all over Colorado, New Mexico, Texas, Baltimore and Washington, D.C., viewing art. This year, I’ve visited New York and Philadelphia. The quality of work on display at Shy Rabbit is comparable to anything I’ve seen. In some cases, it far exceeds the excessive drivel churned from MFA programs filling galleries and nonprofit spaces. Converse to the frenetic, Shy Rabbit provides a calm via artists dedicated to innovation, craftsmanship, perseverance and passion. These artists are committed to the art and not the market, something that can be found only outside an art world center. Take, for example, Ron Fundingsland, a 1970 graduate of the University of Colorado. His aquatint etchings are truly brilliant. The craftsmanship is impeccable. He is a master printmaker, the kind that typically works at places such as Crown Point Press in San Francisco or Tamarind in Albuquerque with other artists to make their creative vision a reality. But Fundingsland also is a highly creative and visionary artist. His works are subtle, yet powerful, and sometimes merciless, yet beautiful. On display at Shy Rabbit are three small valentines that are anything but kitschy and romantic. 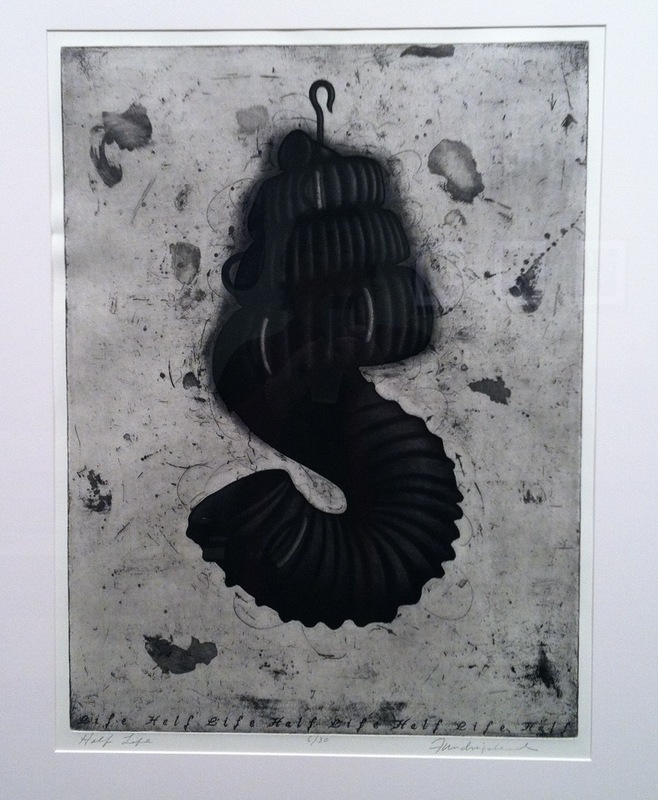 These prints, by isolating familiar objects and taking them out of context, dramatize illusion. The play of light and shadow provides mystery. In “Coronary,” two heart shapes are connected by a bent tube. Is it cherries on a vine? Or a bent dumbbell? “YOUR MIND” is emblazoned in the blue heart,“ALL MINE” in the red. The color is dripping from beneath. Another valentine features a locked heart. A third, a tube of lipstick and a bullet. These are personal and challenging works about domestic violence and abuse. They take the puffed candy heart to a level that’s anything but sweet, yet they remain beautiful. 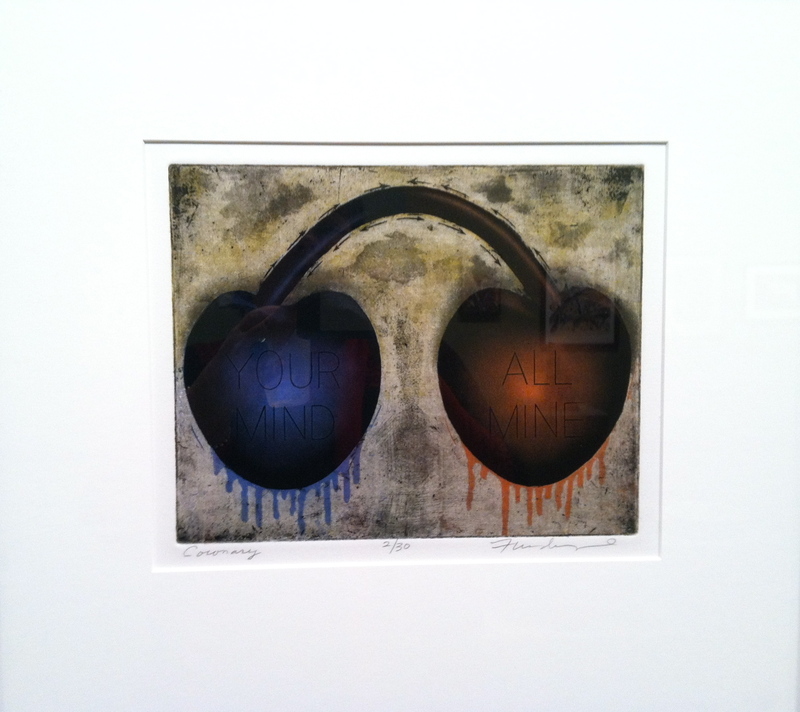 Fundingsland’s prints are in the collection of the Denver Art Museum, which should consider offering him a retrospective. He’s also in the Seattle Art Museum, Fine Arts Museum of San Francisco, the Nelson-Atkins Museum and many more. This year, at the North American Print Biennial, Jim Dine awarded Fundingsland the Ture Bengtz Memorial Prize. If Fundingsland lived anywhere but rural Southwest Colorado, he would be handing the prizes alongside Dine instead of receiving them from him. His work is that good. And though he is represented by Robischon Gallery in Denver, I never see his work there, and I should. Instead, I have to come home, where I can thumb through the flat files at Shy Rabbit and peruse his lush, brilliant, museum-quality prints hanging on the wall in a warehouse in a town with a population of barely 10,000. Along with Fundingsland, the Coffees have cultivated relationships with other artists of great talent from around the country. This show also features the unsettling mutant lithographs of Michael D. Barnes from Illinois, the shattered and remade ceramic vessels of Patrick Shia Crabb from California, the elegant vessels and forms of Jeff Pender from North Carolina, and the organic salt-fired stoneware of Brad Schwieger from Ohio. These works are shown with Michael Coffee’s Shino, Ash and Tenmoku glazed stoneware Chawan, Ynomi, Guinomi and Mizusashi, which are collected and prized worldwide, and my personal favorites, his tall, rootless jars in handmade metal stands. Coffee teaches ceramics and his own trademarked version of Reductive Ink Monoprinting that does not require a press. A significant portion of artists on view are current and former students, including Sandy Applegate, Debra Blair, Marti Bledsoe, Lal Echterhoff, Charla Ellis, Ruth Fiege, Gail Hershey and Maureen May. Blair’s mixed media abstractions embellished with embroidered stitching are vibrant and textural with balance and energy. In fact, all the print work by these artists is highly competent with strong design. The exhibition also includes paintings by Karl Isberg from his Hermetic Book Series and fantastical animal skulls by Chris Haas. 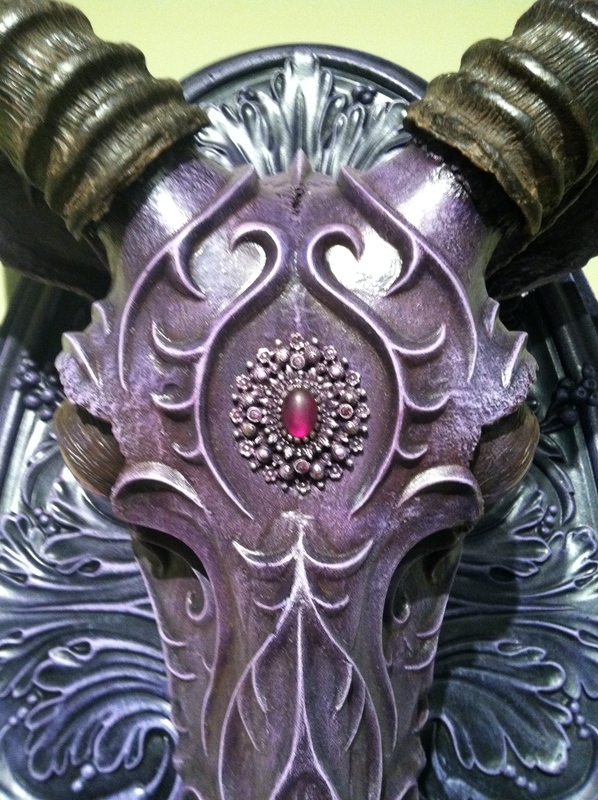 Inspired by the post-industrial Rococo works of acclaimed contemporary artist Kris Kuksi, Haas has created his own version of Damien Hirst’s diamond-encrusted skull; but where Haas’ ornate and embellished animal skulls are instilled with life and meaning, Hirst’s remain tedious and hollow. The contemporary art world often seems meaningless – spectacle for the sake of spectacle. In Denver, there is angst about the market (or lack thereof). The city continues to elevate its cultural profile, most recently with the opening of the Clyfford Still museum. Still left New York in 1950 and rarely showed his work, choosing instead to move it to a warehouse in Maryland until Denver built him a museum that now has 94 percent of his oeuvre. It’s that same spirit and belief in the art I find here at Shy Rabbit. It’s nice to be home for the holidays. Holiday Group Show at Shy Rabbit Contemporary Arts, 333 Bastille Drive, Pagosa Springs, through Jan. 22. The gallery is open from 10 a.m. to 4 p.m. daily and evenings by appointment. For an appointment or more information, call 731-2766 or visit www.shyrabbit.com. Leanne Goebel is a freelance writer and member of the International Association of Art Critics. Reach her at artsjournalist@mac.com.